High quality benches are selected for sharp weather conditions, temperature change, corrosion resistance and longevity. 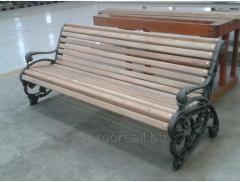 The benches' headers can be decorated with different types of decoration. Park, school, hospital, leisure center and other public places can be installed. Принадлежности для дачи, сада и огорода от компании Azexport Баку (Азербайджан). Каталог товаров - Принадлежности для дачи, сада и огорода. Продажа оптом и в розницу. Звоните!